I joined Instagram. Why would I join yet another time-sucking social media site (I mean really, when does it stop?)?? Well, I was thinking of taking one photo to capture the day for a whole year and then I joined and wanted a bit more focus. So, it’s my goal to capture a year of firsts. Everyday. It’ll be a challenge for sure. You can follow me if you click on my link on the sidebar. Now onto my other project for the year, one inspired by Kay’s Bookish Nostalgia. I love her glimpses into her reading past and have been thinking of a way I could steal the idea but make it my own 😉 I think I have it. I am 5+ year mother. Due to many things (stay-at-home mom to a kid with medical mysteries and special dietary needs being the biggest one) I remember carefree reading and blogging days from afar. So, I decided to choose the year Gage was born and revisit it every month. If January is any indication, I think this will inspire me. I loved looking back at January 2010, I was such an active blogger! I posted 30 days. That’s right, 30 out of 31 days. I went back and read them all and, if you don’t mind me saying, they were all pretty good. I had just finished 2009 by reading 130 books and thought this might continue, lol. I was giving away books monthly, posting quizzes, joining challenges. I was also getting pregnant, but I didn’t know that yet. I attended two author events (Beth Hoffman, Tracy Chevalier) and posted two author interviews (Beth Hoffman, Shirley Tallman). I would love to do more author interviews, but probably not this year, unfortunately, they took a lot of time. I read Garden Spells and fell in love with all thinks Sarah Addison Allen. 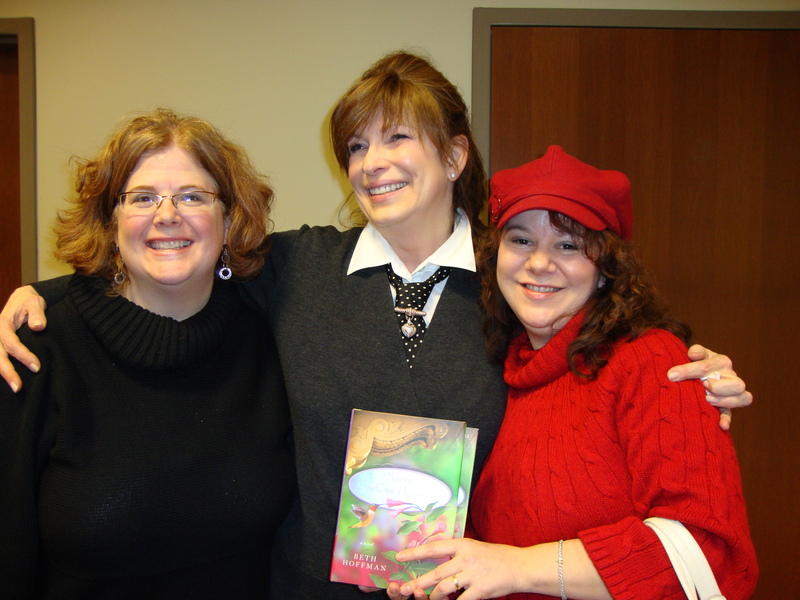 Bonnie (Redlady’s Reading Room), bestselling author Beth Hoffman and me. Tonight I met Bonnie from Redlady’s Reading Room for the first time. We only live about 20 minutes from each other and we decided to get together and meet Beth Hoffman, author of Saving Cee Cee Honeycutt. Bonnie is a fellow Ohio State grad and we had a lot of fun chatting before we headed to the library for the book discussion and signing. I have exchanged a few emails with Beth and knew that she was sweet. However, I think she was even sweeter in person! She was full of charm and warmth and if you have the chance to meet her on her book tour, take the opportunity! (tour locales here) She was truly inspirational. I should note that before her discussion she talked to Bonnie and when Bonnie introduced me, Beth said, “Oh, Stacy, Max’s Mom!” Well, let’s be honest, I was floored that she remembered to mention him. How cool is that?! Favorite Post – My Reread Project. I’m not sure why I stopped doing this, but am ready to try again. …What does this have to do with rereading books? Well, what I get out of a book is based on many things, not the least of which is what was going on in my life when I read it. So, maybe if I read it five years later and I’m happier, sadder, more stressed out, whatever, I might have a completely different opinion of the book. So, last year I decided to commit to rereading at least one book from my Favorite Books list every year. Yes, if I only read one a year it will take me 100 years, so it is obviously not a perfect plan, but quite a few of the books on the list I have read more than once already…. Favorite Book – Saving Cee Cee Honeycutt by Beth Hoffman. I continue to love and recommend this book! Favorite new movie – Avatar 3D. But I did also post about one of my all-time faves – Pride and Prejudice, the mini-series with Colin Firth. Why I love it– Um, Colin Firth as Mr. Darcy. I know there are lots of other great reasons to love this movie, but if you take Colin Firth out of the picture, this is no favorite! I thought Jennifer Ehle was a great Lizzie. She had warmth, sparkle, and a quick wit. The rest of her family was suitably annoying and ridiculous, but in a good way. 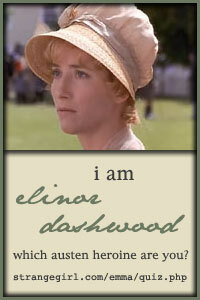 Now that I’ve read the book I can truly appreciate how closely this follows Austen classic. The sets were perfectly lovely and not Hollywood in any way. There were added scenes to let us see a bit more of Mr. Darcy and that made it easier for me to see him apart from only the times Elizabeth saw him, as was the case in the novel. Well, the reason I’m reviewing this now is because Jason really, really loves me. We watched an hour a night for a week. It was so much fun introducing Mr. Darcy and Elizabeth to him. He really didn’t get Mr. Darcy’s appeal, especially for the first half of the movie. I kept telling him it was Colin Firth and that’s all he needed to know, but he still wasn’t convinced. And I’m still waiting for him to come home with a 5 hour miniseries about the history of the stock market or 100 years of Michigan State basketball. If you were blogging in January 2010, why not leave a link to your favorite post? I’d be happy to post it here and then we’d all be taking a trip down memory lane? Nise from Under the Boardwalk chose this post as her favorite. I looked over my posts of January 2010 and was tickled to see one about book shelves. Only one of the shelves has remained – I stack my library books on the steps in the order of their due date! I think what you’re doing is very cool. And, thanks to you, I also recommend CeeCee Honeycutt and Beth Hoffman’s other book, too. Several years ago I went all the way to Oakland (about an hour’s drive for me) to see Beth based on your say so. It was one of the better choices I have made in book world. She’s terrific and a heckuva writer. Thanks for the push. I love that photo! Any time you’re with Beth Hoffman is delightful – she is such a treasure! What a great post, Stacy! In January 2010, my husband and I were trying for a baby, but not yet pregnant. It wasn’t something we had announced yet–actually, we didn’t announce anything publicly until we were pregnant, and even then only to a handful of people. I had really slowed down my blogging that year, going from over 200 posts to about 160 that year. January 2010 was the month we discovered our cat Anya had a rare medical condition. She had to have a blood transfusion and lots of tests. I’d never spent so much on a vet bill before–and yet my husband and I didn’t even blink because we’d do anything for our animals. Whitewashing in literature was the big topic on Twitter about that time. My favorite read that month was American Rust by Philipp Meyer. This is wonderful, Stacy! I remember reading your blog in 2010. Sadly, I deleted my blog from that time so I can’t see what I was up to. However, I remember you being pregnant and Wendy too. And I remember that cat health problem that Wendy’s Anya experienced. Thanks for being so nice about my Bookish posts, but I stole the idea from other bloggers as well or rather put my own spin on the idea. As you have. Oh and I remember reading Beth Hoffman’s CeeCee Hunnicutt book and loving it. I’ll look forward to this every month. And I love your ‘rereading’ project from that time. I hope to do a bunch of rereading this year in conjunction with my ‘read from my own shelves’ quest. Good job, Stacy!! What a fun blast from the past. I loved Beth H’s Cee Cee Honnicut book. I think it’s so neat that you got to meet up with her and Bonnie.